Diamond clarity refers to the internal and external imperfections of a diamond. Clarity is evaluated by considering the size, the placement, the quantity and how noticeable the inclusions are. With clarity being the second biggest influence on the overall price, buyers typically opt for “eye clean” diamonds which do not have any inclusions that affect the overall beauty of the stone. These “eye clean” diamonds have inclusions that are not visible to the unaided eye when viewed face up at a distance of approximately 6-12 inches. When looking to purchase a diamond, cut is the most important element to consider since it dictates the sparkle of the stone. Even diamonds that are graded highly in colour and clarity with a lower graded cut can still appear dull and lifeless. When a diamond has the proper proportions, the light is refracted out the top of the diamond which results in a brilliant and colourful sparkle. With a lower cut grading and improper proportions, diamonds either possess a cut that is too shallow or too deep. Diamonds that have been cut too shallow lose light out the bottom of the stone which causes it to look dark in the centre. With diamonds that are cut too deep, not only does the light escape out the side of the stone, but they are also smaller in appearance. Without the proper proportions, the carat weight of a stone does not necessarily dictate the visual size of a diamond. This can result in a stone that is visually smaller in relation to the carat size. These type of stones are typically a better price point which can make them seem appealing. However, as a consumer this means that you are paying for carat weight that does not reflect in the size of the stone. Ultimately, not only is it more cost effective to purchase a stone that visually corresponds with its carat weight, but it will also ensure that your stone has a beautiful sparkle and fire. For fancy shapes, it is important to note they do not necessarily have a cut grading. They are primarily graded on their polish and their symmetry, with the highest grading between the two being utilized as the “cut” grading. Due to the nature of the facets, it is extremely important to invest in the polish, but most importantly, the symmetry of the stone, since stones with lower symmetry tend to look shattered ruining the overall appearance of the stone. Most diamonds have hints of colour and subtle differences can have a massive impact on the price of a stone. The colour grading scale begins at ‘D’ and ends at ‘Z’, the top of the colour scale represents the rarest most colourless diamonds which are the most expensive, with only certain fancy colour diamonds surpassing these stones in terms of price. Fancy coloured stones are graded on a separate set of parameters particular to their individual colours. Diamonds are composed of carbon and trace impurities such as nitrogen causes a yellowish tinge in the stone. They may also have a brown tinge to them which is caused by internal graining often combined with nitrogen. Round Brilliant diamonds with the proper proportions typically hide colour more successfully than their fancy cut counterparts. It is important to note that fancy shapes such as emeralds and pears have broader facets which ultimately reveal more colour than a round brilliant stone. Carat weight literally refers to the weight of a diamond - 1 carat is equal to 200 milligrams. The most common misconception when looking at purchasing a diamond is that the carat weight corresponds to the overall size of a diamond. Out of the 4 C’s, carat weight has the greatest impact on the price of a stone. However, a deep diamond that may have the 1ct weight may not appear to be the size of a 1ct diamond with the proper proportions, and although the stone may appear smaller, you will still pay the price for a 1ct due to the weight of the stone. As mentioned under the diamond cut section, stones with the improper proportions (most commonly stones that are cut too deep) lose their brilliance and scintillation which results in them appearing dull. 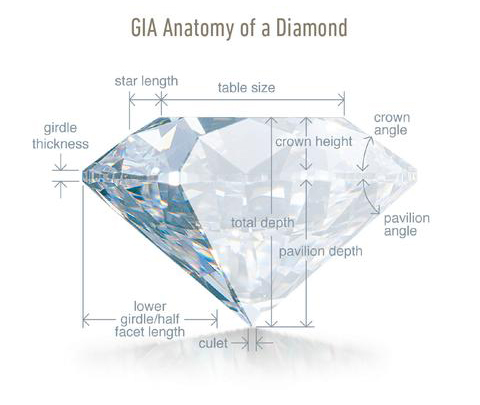 Ultimately, when looking to purchase a diamond, it is of utmost importance to consider the dimensions and proportions corresponding to the carat weight. There is no sense in purchasing a diamond with a particular weight, while paying a premium on stones such as 1 carat, without having the visual size. For budget sensitive clients, we typically recommend looking for weights slightly below the popular sizes (0.50ct, 0.75ct, 1.00ct, 1.25ct etc.) with the proper dimensions to give you the desired look.